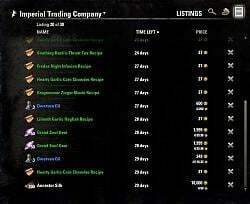 This addon augments the guild store interface with many useful additions. Before you report something, please make sure you have installed the latest version of all your addons and check the Change Log for known issues. 1) What were you trying to do? 3) Which steps did you take? 4) Can you reproduce it a second time after logging out and in again (or /reloadui)? Screenshots and videos are also very useful to figure out what is going wrong. In addition you should also log out (or /reloadui) and upload the LibDebugLogger.lua from your Saved Variables somewhere and include a link to it. It contains a lot of useful information that will make it even easier for me to pinpoint an issue and get it fixed fast. Q: When can I use this awesome addon in gamepad mode? A: There are currently no plans to support gamepad mode. Q: How can I select multiple buttons on a filter? A: Holding the ctrl key while clicking the buttons will allow you to select or deselect more than one. Q: The search request failed, how can I restart it? A: Just press the "show more results" button or keybind and it will continue from where it stopped. Q: I cannot find the guild tabard anymore? A: The tabard is treated as a regular search result and can be found in the Apprarel > Appearance category or filtered for in other ways (e.g. text filter). Q: My Deal Filter disappeared/stopped working/throws errors? A: The deal filter is not part of AwesomeGuildStore. 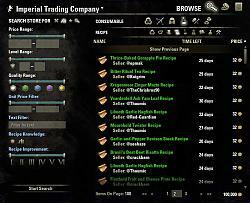 It always has been a part of Master Merchant, so you need to check for updates there. Thanks to everyone who writes in the comment section. You are the people that motivate me to continue developing this addon. Once you enter something in the text box, it will instantly show you the auto completion provided by the game. In addition you can also search for more complex expressions as described below. Search terms are case insensitive and are matched against the item name and set name where applicable. Besides searching for names it is also possible to filter for specific item links. You can easily acquire an item link via the context menu on any item or item link by pressing "Link in Chat". Just cut and paste it from the chat input to the search box with ctrl+X and ctrl+V. The text filter recognizes many commonly seen operations that will allow you to filter for exactly the terms you want. You can require all search terms to be present in any order by separating them with a space. Or you can separate them with a "+" which will mark the beginning of a new search and allow you to find multiple different items. You can change how operators are applied by using parenthesis or even exclude terms by putting a "-" before it. It's also possible to filter for an exact sequence of characters by using double quotes. The search terms are limited to a length of 250 characters to keep some leeway for planned features. 'shadow ring' will match any item that contains shadow AND ring in any order. There are many possibilities, so try what you can think of and let me know in the comments if you found an especially useful combination! Before using this version, please make a backup of your saved variables, just in case something goes wrong. 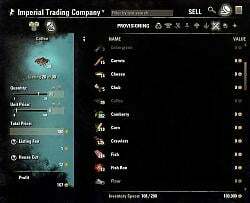 Item preview does not work for cached items. If you want to preview something, use the new "Search For Item" context menu entry to request that specific item again. 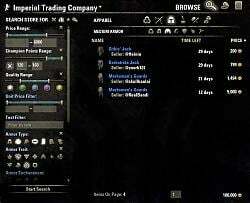 When closing the trading house via the gamepad ui toggle keybind, AGS won't do anything on the next store visit. You need to close it manually for now. Closing it manually will also get you unstuck in case you accidentally closed it that way. This is actually a game bug (happens without AGS too), so it is up to ZOS to fix it. New texts are not final and have not been translated to other languages yet. 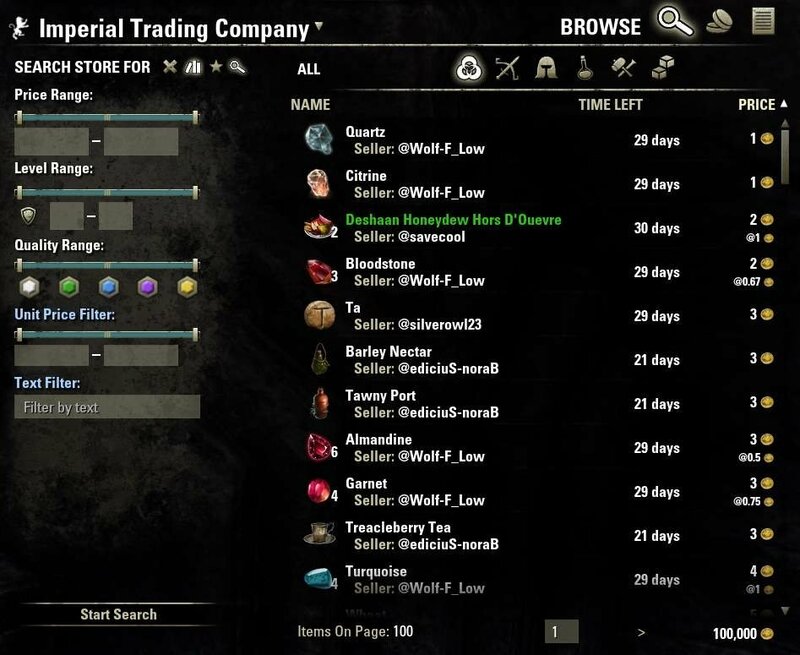 Items that have already disappeared from a store will show up locally until you log out or reload the ui. This is the first beta release of AwesomeGuildStore 1.0. A huge thank you to everyone who tested the development builds this past week, I finally feel it is stable enough to share with a wider audience. This doesn't mean that everything is finished or perfect yet and I will continue to upload new versions as needed, but I also don't want to keep you waiting any longer. 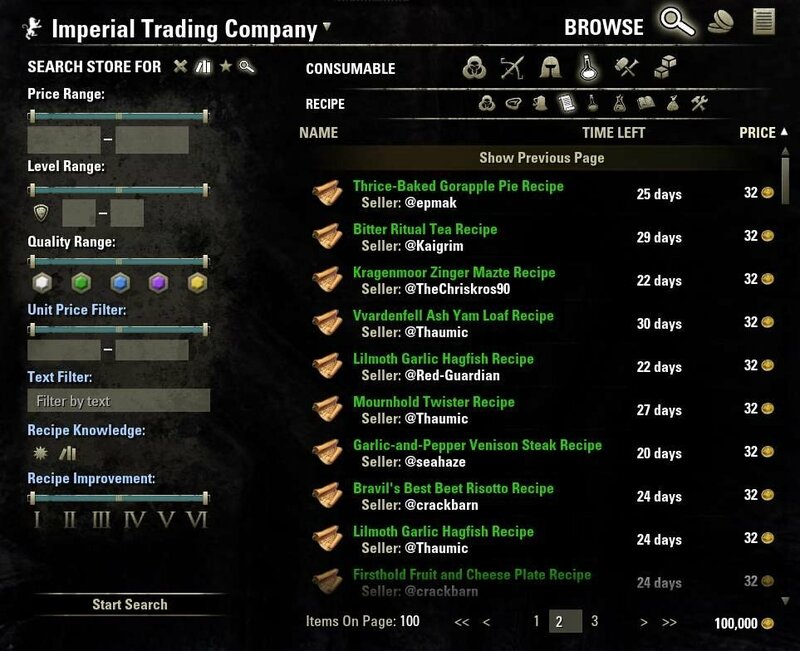 When using the new multi stack listing feature on the sell tab, the price display changes for subsequent stacks. 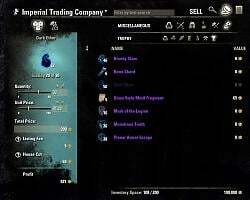 This is purely cosmetic and the items are listed at the correct price. When canceling multiple items on the listings tab, the cancel button shows up again when the list is refreshed. 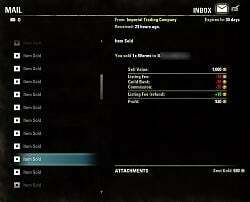 When closing the trading house via the gamepad ui toggle keybind, AGS won't do anything on the next store visit. You need to close it manually for now. Closing it manually will also get you unstuck in case you accidentally closed it that way. Due to the changes in the reworked filter system, it is unfortunately not possible to bring the old favorites over into the new system. you'll have to set up your searches from scratch. Sorry for the inconvenience. All server requests are now handled by this system, so you can use the store without having to wait for answers from the server. Per default it will only log basic information, but it can be configured to log everything including stacktraces which can be very important when debugging problems. If you need to access something that is not specified in those files, please let me know so I can add it to the API. Everything else is for internal use only and subject to change at any time. added shields to "Apparel > All"
removed trait items from "Crafting > All"
NOTE: only newly listed items will show up in the correct category. Items listed before the update will continue to show in provisioning > rare materials so you should relist your decorative wax! fixed some occurrences of "Warning: Could not match kiosk name"
changed how resetting search tab filters works in order to account for a newly added base game feature. 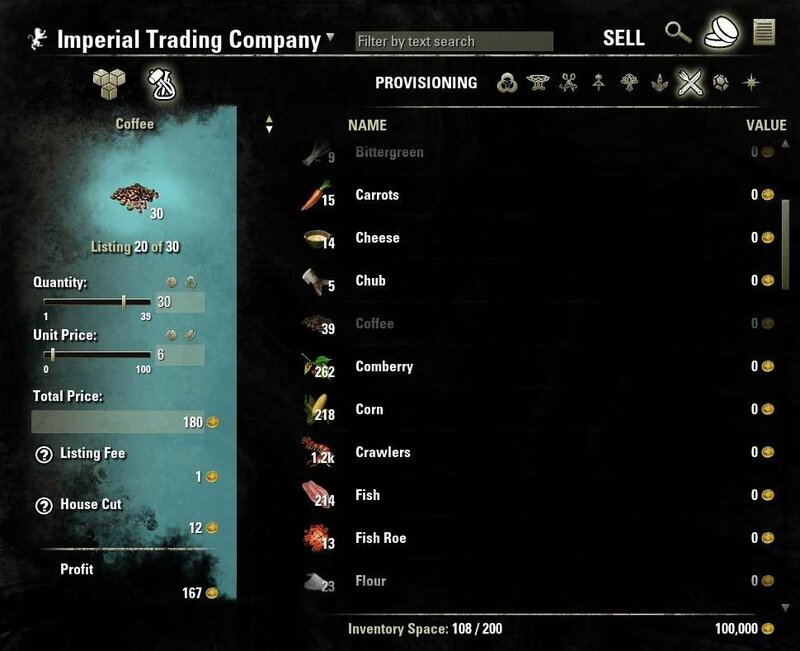 NOTE: Due to the new 9th item type in the consumable category, fish will no longer be part of "Consumable > All". You can still find them in "Consumable > Container". 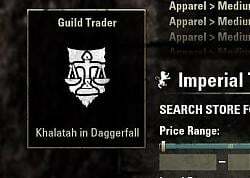 NOTE: Master Merchant has a similar option. It is highly recommended that you only activate one of them at a time! NOTE: This is disabled by default in the settings as MM has a similar feature that cannot be disabled at the moment. removed shields from "Weapon > All"
This release contains some fundamental changes to the code. If you notice anything that does not work as expected, please let me know in the comment section. 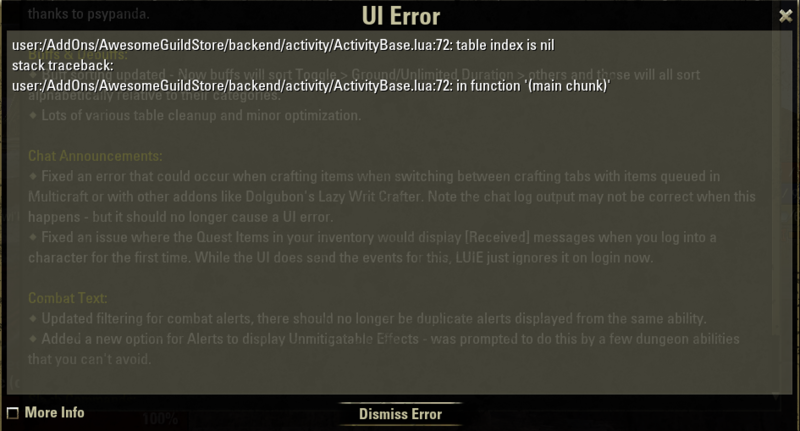 fixed an exception when guild kiosks have an invalid state after visiting a guild store. This is a bug in the game which I can do nothing about. It will (hopefully) be fixed with the next game patch. added a normal UI error message that tells you that the kiosk is bugged. changed level range selection to search for level 1-50 items when 1-50 is set in the text fields. Leaving them empty will now search for all items regardless of level. Last edited by sirinsidiator : 04/14/19 at 01:28 PM. AGS has been unable to work for about the whole of the wrathstone patch so far i have nailed it down to LibDebugLogger every other library is working perfectly fine but when i enable this it freezes on reload and eventually boots me back to login. Last edited by heady : 04/25/19 at 09:07 AM. In my experience, holding the left Ctrl key down does not work while it is bound to Sprint (that is its default keybind). The player must either hold down the right Ctrl key instead, or unbind Sprint from left Ctrl and bind it to some other key(s) instead. The way this is handled in the code has nothing to do with keybinds for the game. It uses the modifier keys that are passed along by the game when a button is pressed, which should work regardless of any keybinds. Left ctrl and shift are the keys I tested it with and they work without a problem for me. Which operating system and keyboard layout do you use (you can also just send me the LibDebugLogger.lua savedata if you don't know)? Does it still not work when you disable all other addons? in general, thank you for an awesome addon! Last edited by Amiliana : 04/12/19 at 11:03 PM. Im so sorry that AVG still is heavily bogged down by abysmal performance, especially so when posting items to sell. The endless waiting and many failed requests is simply too much. I test this problem when only AGS is active, and it still happens. With AGS disabled using Master Merchant everything becomes much much faster. For now I will disable AGS and just use MM. MM can luckily remember last total price used and supports inputting decimal unit price, which is some of the two most valuable and essential features when posting. The missing functions from AGS, namely, the display total sell value of all listed items, the automatic item stack splitting function, and unit price setting that remembers what you listed each item for last, is something I will miss surely, but fast posting of items (3x as fast at least) is worth missing those. I hope at some point sirinsidator will work out the issues causing this, however I am still unsure whether sirinsidiator acknowledges these extremely slow wait times for posting items as a bug in AGS? In any case, I am happy for all the time I have spend using the addon, it's been great. But now it's time to take a break. Hoping everything best for the future and the addon and I will activate it again from time to time to test if more updates will come out. Last edited by jayman10000 : 04/11/19 at 09:55 PM. Interesting revision of the Info Tab. As to the Changelog Tab, the current AGS is the first one that I've ever seen with a large 'document' entry. Usually they have maybe two or three lines about correcting a bug or changing a feature because the ESO API changed. As for the automatic search, as I have written before, it's not something that can easily be turned off. I plan to change it so it only starts after you interact with the search tab in some way, but it's quite complicated. 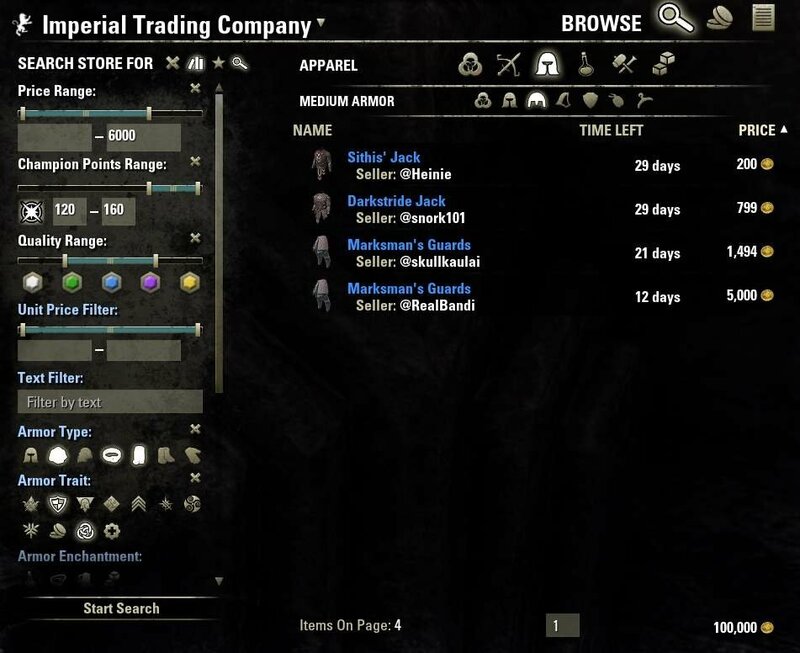 A potential short term solution could be to change the banker so it opens the store at the sell or listings tab instead, which would also avoid triggering the auto search. Does that sound good? Yes!! I have wondered whether it could be possible to change the order in which the three features are opened to Listing, Sell, Search. That is, when I access a Guild Store UI via a Banker. 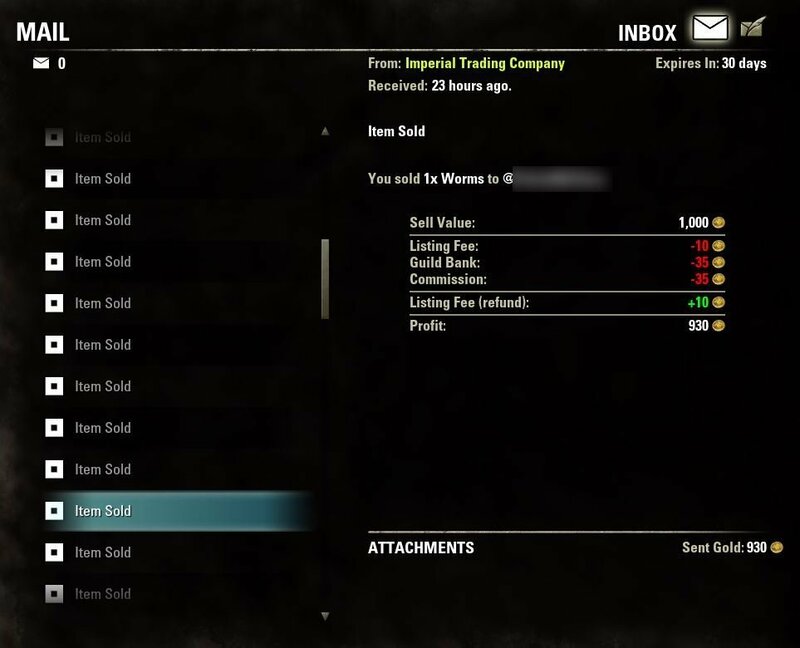 The Listing and Sell features are not included when I access a Guild Store via a Guild Trader. Perhaps you cannot do anything about it, but it would also be best if a New Search did not begin searching until I have entered all search terms. I have discovered that, currently, New Search results do not consistently include all available items which are specified by the complete set of search terms. Search for More Items is greyed-out by the time I finish entering them. 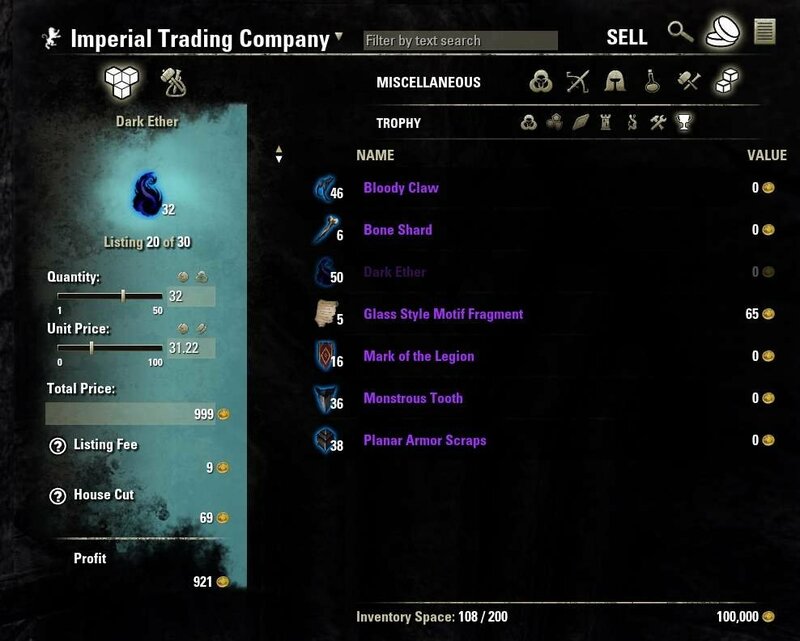 Switching to another Guild Store ordinarily provides the most complete list of the item(s) for which I am searching. 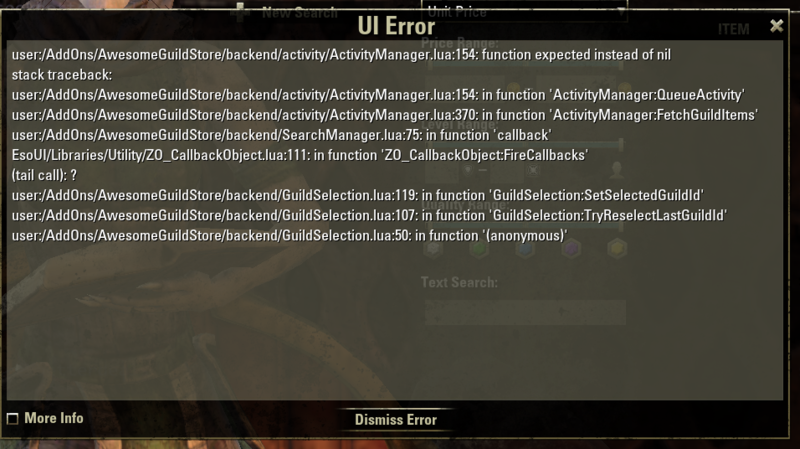 Unfortunately, I cannot redo the search for a Guild Store without exiting AGS, then accessing the Guild Store UI with AGS again. 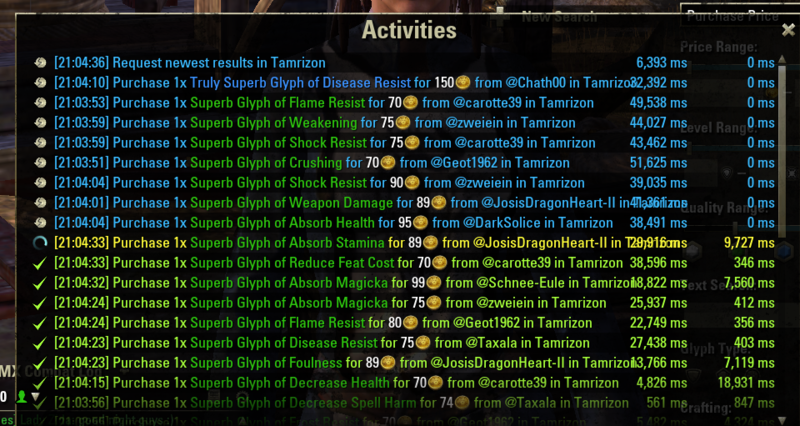 Note: in my experience, this issue only occurs when the current Guild Store has more than 100 items that satisfy the complete set of New Search terms. However, it does affect searching stores via Guild Traders. Thanks for your reply about the screenshots. With regard to the first two, often the message "Could not request search results" appears in the upper right corner of the HUD when either one happens. The screenshots probably don't show it because it faded before I pressed the keybind to create them. So I will try to react more quickly in the future. But even if that message is displayed, I assume that the respective outcomes are not affected by the autosearch. The third and fourth are hard to tell why they happen. The next time you encounter them, please click on the status label in the bottom left corner of the store UI ("Request finished") in order to open the activity log. Then put your mouse over the failed request and make a screenshot of the tooltip and log. Afterwards reload your UI and upload the LibDebugLogger.lua in your saved vars folder and the screenshot somewhere. That way I can actually tell what is going on. Will do. However, I do not have a way to upload the debugger .LUA file itself. 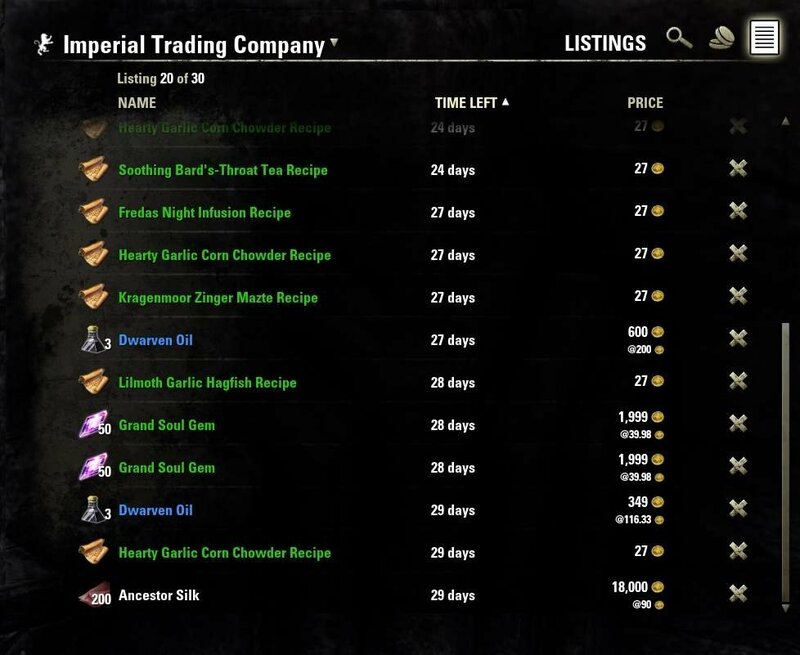 For the third one, I neglected to add a note that the outcome shown occurs after I switch from the Listings for one Guid Store to the Listings for a different Guild Store. (Of course that only happens while I am accessing Guild Stores via a Banker). Although the two copies of the Debugger file that I have saved are less than 1 MB in size, it would be infeasible to copy their entire text into an online text editor. Last edited by Shadowshire : 04/12/19 at 09:51 PM. Last edited by Marazota : 04/10/19 at 01:25 PM. I would welcome that. During prime time (e.g. right now) that first request can take ages, and I can't start selling until it's completed. Getting this all the time and it really hinders me while buying/selling stuff, is there any way to prevent the permanent requesting? Quick question: how do I turn off auto requests? If you have found this page you probably want to tell me that you have too much money, eh? Well. Click the button below and make yourself happy then. Thanks a lot for your patronage!